Dragon is taken to the Pentagon by Invincible so that he can speak with Cecil Stedman about the threat of Solar Man. The heroes are surprised to discover that the government are quite content to allow Solar Man to continue unimpeded as he is doing exactly what they wish to be done. The mess that had been caused by CyberFace and then Mister Glum is being cleaned up finally and super-powered threats are being eliminated. Solar Man is to be left alone, a directive that shocks Dragon considering the trail of death he has left in his wake. One of the Uglies Unlimited decides to finally brief their captive on their motives. She-Dragon is told how Bellco Chemicals have been using Chicago as a testing ground as they have created hundreds of mutants with their chemicals. They are then forcing their own victims to purchase the Freak Out cure and it is this dishonest behavior that they are hoping to expose. Belinda Bell would have been traded for a ransom which would be an admission of guilt. She-Dragon asks how the mutations came about and is informed that the chemicals are in the city’s water supply, the same water she is currently drinking. Solar Man closes in on his next target, Horridus, who has been on the run for years now ever since she was framed for murder. Rex Dexter had finally tracked down Horridus when he discovered that she was to be eliminated by Solar Man. He points out that she is an innocent and is incapable of committing murder but his words are ignored. Solar Man unleashes his heat vision but Rex diverts his head but the energy connects with part of a building that buries Horridus. With his task completed Solar Man moves on to his next objective. Rex digs through the rubble until he has pulled out the now lifeless Horridus. He hears a noise nearby and discovers that Horridus has given birth to a baby girl whose appearance makes it quite obviously his daughter. Rex’s robot minions arrive and are instructed to take care of the child and make every effort to resuscitate Horridus. He then departs as he has a mission of his own to complete. Meanwhile in Dimension-X, an alien is knocked unconscious by Malcolm Dragon as he leads his young friends to a rocket. They will fly this spaceship to the nearby Glum World where it has been discovered that there is a means to transport them back to Earth. 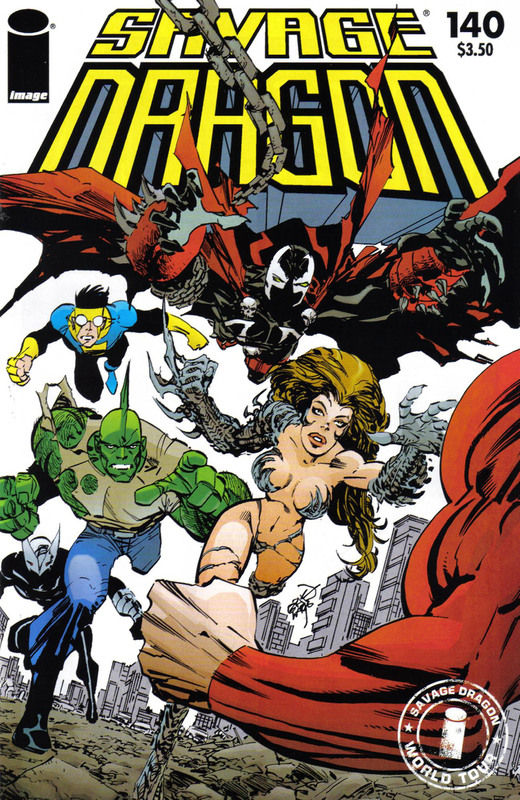 In New York City, police officers race to the scene where Spawn has been battling a super-freak and they hope to arrest the hero. Detective Sara Pezzini hears of this action and moves to intercept after having worked beside Spawn before in her guise of Witchblade. She has soon joined her fellow hero and together they fend off the police. Solar Man suddenly bursts into the building after having marked Spawn as his next target to eliminate.